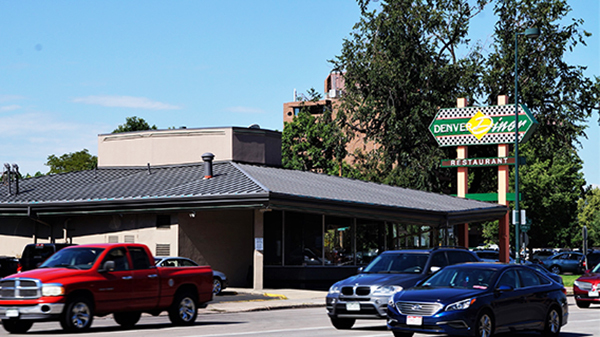 Denver Diner is located at 740 W. Colfax Ave. Photo by Thomas Gounley. The longtime owner of the Denver Diner on West Colfax has sold the property, but will continue operating the restaurant. George Skordos sold the 0.37-acre lot at 740 W. Colfax Ave., right next to Speer Boulevard, last week for $3.6 million, according to county records. The buyer was Denver-based real estate firm Brue Baukol Capital Partners. MidFirst Bank provided financing for the deal. Brue Baukol CEO Chad Brue said in an email Sunday that “we did a sale-leaseback” with Skordos. “Denver Diner (the business) will not be going anywhere anytime soon,” Brue said. Brue did not respond to additional questions. At the diner on Friday, Skordos told a reporter he did not want to discuss the transaction. Skordos had owned the property since April 1996, when he bought it for $665,000, according to records. He’s owned the business for even longer. According to The Denver Post, Skordos bought the restaurant in 1990 from the White Spot chain, which began operating at the site in the mid-1960s. The 3,646-square-foot building dates to 1966, according to city records. In January 2014, when The Denver Post looked into what the newspaper characterized as “rumors” that change was coming to the property, Skordos predicted a long future at the site. 1 Comment on "Denver Diner sells for $3.6M"